The Grizzly G9983 is my first wide belt sander. I needed a compact machine with a single phase motor with modest electrical draw. Prior to getting the Grzzly sander I got one other Grizzly machine, a 15″ spiral head planer that has worked well for me, and my experience with Grizzly customer service over the past 10 years has been consistently very positive- no small thing in my book. Right off the bat I fitted the sander with a Wixey digital height gauge. I have these gauges on my table saw and planer, and I would not want to work without them. They have enabled me to set my machines with repeatable accuracy to within three thousandths of an inch without making test cuts. My first first observation in using the sander was that the table height adjustment screw has almost no backlash. The adjustment mechanism is so tight one can practically release the table to a lower setting without then having to take up the slack by finishing up rotating the wheel slightly in the positive direction. Having experience on various American, German, Italian and Asian woodworking and metalworking machines I found the table adjustment on the Grizzly sander to be impressive by any standard. 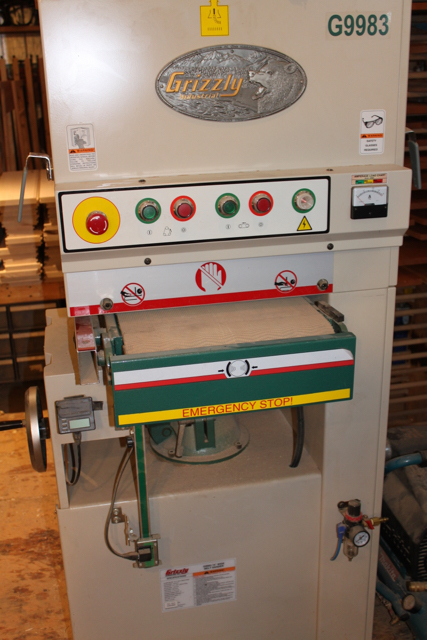 The Grizzly sander manual states that the machine is adjusted properly at the factory. However, I was initially getting a defect in the sanded surface. As the trailing end of the board exited the sander and was released from the in-feed pressure roller, a little sanding gouge occurred about 4 inches from the end of the board. I don’t know if there is a specific name for this; I call it roller bump snipe. When the trailing end pops free of the in-feed roller pressure, the board kicks into the in-feed side sanding drum slightly and creates this gouge. I was able to eliminate this problem by backing off the pressure on the in-feed and out-feed rollers that hold the board tight to the feed belt. These rollers each have a conveniently located left and right side adjustment screw. I used a spacer block like a wide feeler gauge between the belt and the rollers so that all 4 adjustment screws were at the exact same setting, such that there was just enough roller pressure to allow the feed belt to get traction on the underside of the board. This was achieved by backing off the roller pressure until the belt started to slip a bit, and then increasing the roller pressure slightly. This solved the problem, and now the sanded surface is perfectly flat and consistent from end to end. Having never used an open end sander prior to buying this machine, I was skeptical and yet naively hopeful regarding the prospect of being able to sand a door or table top that was up to 30″ wide, in two passes. The beauty of a wide belt sander, in addition to it’s sheer speed, is the fact that everything comes out the other end very flat. Any woodworker will appreciate what an important and useful quality this is. And, as long as you’re sanding pieces 15″ or less in width in single passes, the Grizzly is great, achieving very consistent thickness across the width of the board. However, when making two passes with a wide board it is easy to have a little overlap in the middle, and this creates a dip; the surface is no longer flat. Invariably any wide piece that I would consider sanding in two passes in going to be a valuable piece. It will be valuable either because it is a very wide single board which is more rare and costly, or it is a glued up or assembled piece like a table top or door, all of which are valuable due to the labor invested. My point being that after attempting to sand just a few wide pieces and ending up with a concave surface, I am leery of trying it again, and have since chosen to go the slower but safer route of using a 6″ Mirka random orbit sander. In conclusion I would say that the grizzly 15″ open end wide belt sander preforms beautifully for sanding pieces 15″ or less in width. It is an order of magnitude faster than working with the random orbit sander alone; literally turning what would be hours of sanding with the 6″ Mirka, into minutes of sanding. If I run stock through at 120 grit, the resulting rough sanded surface is much faster to finish sand with the random orbit than the compacted machined surface right out of the planer would be. I love it for sanding cabinet doors, but I am limited to the 15″ width. I make a lot of cabinet doors between 15″ and 18″ in width, and so in retrospect the slightly wider grizzly 18″ wide belt sander would have been a better machine for me, foregoing the ability to sand wide pieces in two passes, a feature I’m not using, and gaining the ability to sand cabinet doors up to 18″ wide, something I would be doing often if I could. Perhaps I will glue up a wide test piece, and see if I can arrive at a technique to successfully sand wider pieces without overlap, and without an un-sanded strip in the middle, maintaining a flat surface. If I am successful I’ll let you know.